O'D-AIR INLINE OZONE GENERATORS The long-awaited O'D-Air in-line unit, carries the usual O'D-AIR guarantee of absolute odour elimination. UK design and specifications, cleans up to 50,000 cubic feet of air. 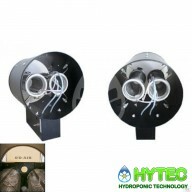 A two cell, in line unit which fits directly into a 10" or 8" ducting ex..